Enriched Bleached Wheat Flour (wheat Flour, Niacin, Reduced Iron, Thiamine Mononitrate, Riboflavin, Folic Acid), Water, Vegetable Shortening (interesterified Soybean Oil, Hydrogenated Soybean Oil And/or Palm Oil), Contains 2% Or Less Of: Sugar, Salt, Leavening (sodium Bicarbonate, Sodium Aluminum Sulfate, Com Starch, Monocalcium Phosphate And/or Sodium Acid Pyrophosphate, Calcium Sulfate), Distilled Monoglycerides, Enzymes, Wheat Starch, Calcium Carbonate, Antioxidants (tocopherols, Ascorbic Acid, Citric Acid), Calcium Propionate And Sorbic Acid (to Preserve Freshness), Dough Conditioners (fumaric Acid, Sodium Metabisulfite And/or Mono- And Diglycerides). 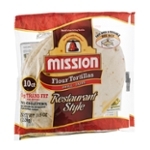 The Oxygen Absorbing, Stay Fresh Packet Enclosed In This Package Enables Mission To Guarantee The Freshness Of The Tortillas For Yon And Your Family. The Contents Of The Packet Are Non-toxic, But Should Not Be Eaten Or Heated With The Product. Please Discard The Stay Fresh Packet Once Bag Is Opened. Contains: Wheat.